In past seasons, Philadelphia Eagles fans generally rooted for their own team, and kept an eye on the rest of the NFC East. In 2018, with the Birds being favorites to represent the NFC in the Super Bowl, it's perhaps worth keeping tabs on the conference, as opposed to just the division. • 49ers at Vikings: The Eagles drubbed the Vikings 38-7 in the NFC Championship Game, but if you’ll recall, both teams had 13-3 records to close the regular season, with the Eagles earning the No. 1 seed on a tiebreaker. The Vikings are a good team, despite what we all saw in that game. 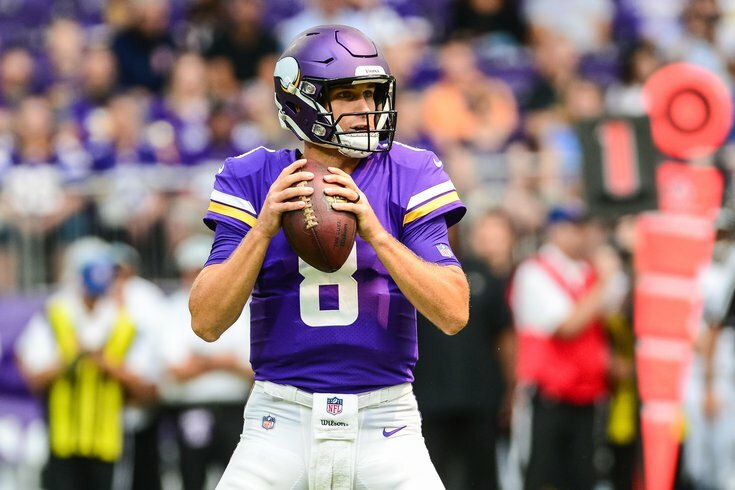 It’s probably better if the Niners are able to hand Kirk Cousins an L in his Minny debut. • Buccaneers at Saints: Clearly, it’s better if the Buccaneers win this game, for two reasons. First, it gives a Super Bowl contender in the Saints an early loss, and two, it perhaps serves notice to the Eagles not to take the Bucs lightly Week 2. Unless of course you took the Saints in your survivor pool, in which case it's OK to selfishly not want to be bounced in embarrassment Week 1. • Jaguars at Giants: Obviously, an NFC East loss against an AFC team is ideal. • Bills at Ravens: The Eagles own the Ravens’ second-round pick, so the worse the Ravens’ record, the better the Eagles' draft pick in 2019. #Analysis. • Seahawks at Broncos: The Seahawks are less of a threat than they’ve been over the last half-decade or so, but an AFC win over an NFC team with a top-five QB would be ideal. • Redskins at Cardinals: In my view, call me crazy, but the Redskins are the biggest threat to the Eagles in the division. The Cardinals, meanwhile, are garbage. A Cards win is preferable. • Cowboys at Panthers: If you can put your Cowboys-hating bias aside, this is sort of a tough call. The Panthers are a bigger threat to the top of the NFC than the Cowboys, and winning the NFC should be the Eagles’ goal, not just the NFC East. Then again, a Cowboys win on the road over a good Panthers team could signal that they’re legit. So maybe it’s just better if the better team wins this one. • Chicago at Green Bay: Aaron Rodgers is dangerous, obviously, and not a player you want to face in the playoffs. The Eagles would probably prefer not having to face Green Bay in January. A Bears upset would be ideal. • Jets at Lions: The Lions are one of those semi-harmless teams that you want in the playoffs. I’m going to say that a Lions win is the better result, even against an AFC team. • Rams at Raiders: Obviously, a Raiders win here is the better outcome.